There is something awfully liberating about learning to do a tiny little bit of leather work. 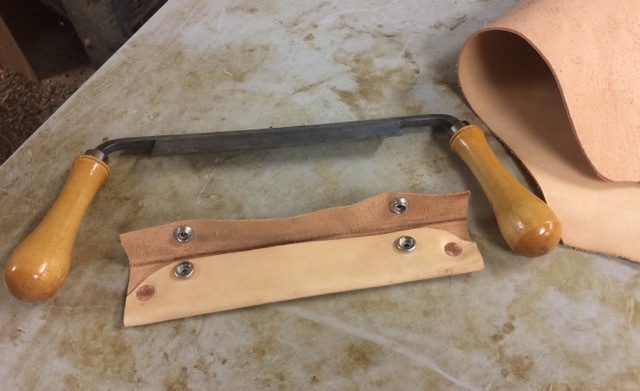 I have wanted a leather sheath for my drawknife for years but I was never quite willing to pay the price. Whenever I go to a class I pack my drawknife in my bug-out bag and endanger the hard won sharp edge. Not to mention endangering me with the sharp edge. When I was at the leather store a couple of weeks ago, I bought a small piece of lightweight leather, 3 to 4 oz weight, I think. I cut a pattern out of poster board and fitted it around the blade until I liked it. I laid the pattern down on the leather and cut around it with my carving knife and then wrapped the cut out around the blade. After snipping two holes for rivets right at the corners of the blade and setting the rivets it looked good. 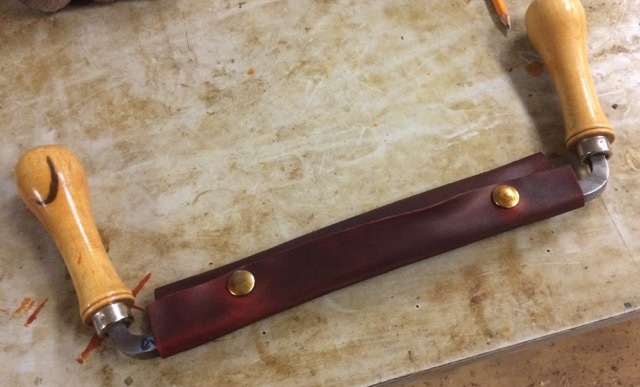 I tried it on the blade and the corners of the sheath were in the way, so I snipped them off. I set two snaps in the flap and pulled the leather tight around the blade so I could mark the other side of the snaps on the body. After completing the snaps, the sheath fit well except for being a little puffy on the bottom edge. I took it off and crimped the bottom with a wood scrap and it held a nice crease making it look a lot better. I put on a coat of British Tan for looks and a coat of Neatsfoot Oil for feeding the leather and called it good. Been wanting a nice cover for a long time. I ‘m so proud!